Protestors of the JUST Act in Lower Manhattan on March 31st. Photo courtesy of Outlive Them-NYC. 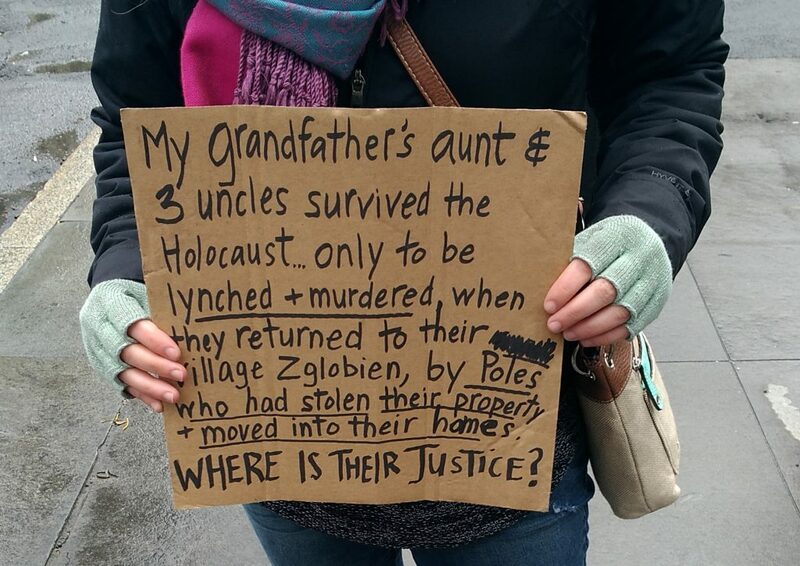 ON SUNDAY, March 31st, we took to the streets of Lower Manhattan to counter a protest of the Justice for Uncompensated Survivors Today (JUST) Act, a Senate bill that accounts for assets stolen from Polish Jews during the Shoah. The act mandates that the US government report on the progress of the 47 countries that pledged in 2009 to return assets stolen from Holocaust victims, and to apply pressure on these countries in case they have not followed through with their pledge. 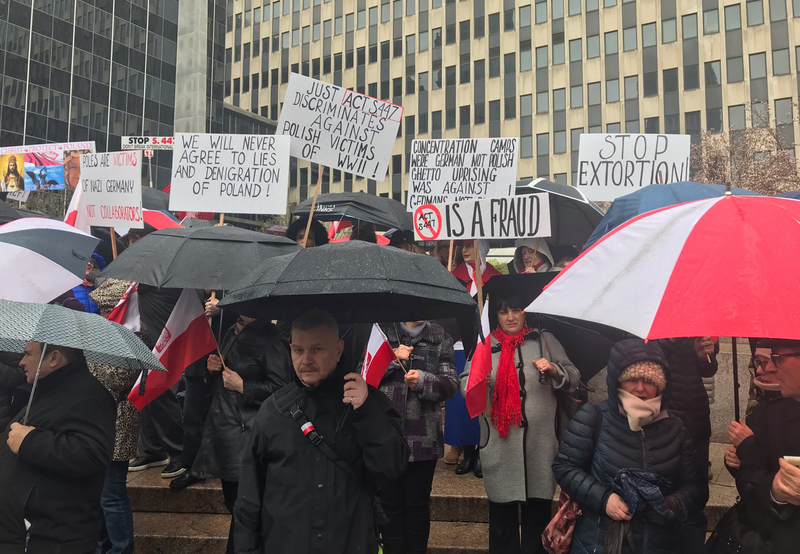 Poland is the only country that has not passed legislation to compensate former assets, and thus many Poles view the JUST act as targeting Poland. Besides New York, similar rallies took place last weekend in Boston, Los Angeles, and Chicago, amounting to a nationwide display of Polish Holocaust revisionism that received very little media attention. Our organization, Outlive Them-NYC, was formed in response to the pogrom at Pittsburgh’s Tree of Life synagogue last fall, and to the rising threat of white nationalist activity in our own city. With less than one week’s notice, we organized our own demonstration, aiming to counter this campaign to rewrite our history and make America forget again. We did so as Jews of the diaspora, as grandchildren and great-grandchildren of the Shoah—heirs to the antifascist resistance of the 20th century and participants in the antifascist resistance of the 21st. A counter-protestor with Outlive Them-NYC. Photo courtesy of Outlive Them-NYC. Banging on makeshift drums, and bearing cardboard signs honoring our dead and demanding justice for the living, we marched, chanted, and sang in an effort to drown out the speakers gathered at 1 Federal Plaza. A moment of stunned silence followed our entrance. It was evident that few among the flag-waving ultra-nationalists had prepared to meet with any opposition, let alone one that looked like this: a multiracial, intergenerational, and intercommunal counter-demonstration of Jews, Poles, queers, socialists, and leftists of all stripes. Our mere presence was enough to elicit antisemitic slurs and threats of physical violence from many in the crowd, some of whom had been identified to us as members of “Autonomous Nationalist” street gangs hailing from the heavily Polish Brooklyn neighborhood of Greenpoint and elsewhere. They jeered and taunted us, denied our families’ histories, and waved dollar bills in our faces. They told us that the Polish Jews had been led to their deaths by other Jews, that Jews welcomed both the Germans and the Soviets into Poland, and that we didn’t know our own history. As the rally continued, and as temperatures rose on all sides, it dawned on us that our small group of roughly 40 was the sum total of New Yorkers who came out to oppose this antisemitic show of force. We found ourselves asking the same question we had asked one another in the streets of Charlottesville in August 2017, and on the streets of the Upper East Side when we protested against the Metropolitan Republican Club hosting the fascist Proud Boys last October: Where is everybody? Despite being outnumbered, members of Outlive Them-NYC—with the support of allies from the local Polish-American left and from groups like United Against Racism and Fascism-NYC—held the line and managed to successfully counter the rally against reparations. The revisionists were fractured, confused, and deflated, and they dispersed early. Yet the threat of ethnonationalism and Holocaust revisionism remains very much with us. Cities like New York are anything but immune from the rising tide of white nationalist terror, which took the lives of more than 50 people nationwide last year. Polish nationalism is anything but exceptional. From Warsaw to Washington, Budapest to Brasilia, we are witnessing a global revival of antisemitic, xenophobic, Islamophobic, and fascistic social movements and political parties like those we confronted in Foley Square. The Holocaust revisionism on display at the protests last weekend feeds on, and further fuels, the revisionism that has become increasingly widespread across Eastern Europe: in Poland, where calling out Polish-Nazi collaboration has been criminalized; in Austria and Hungary, where openly racist far-right parties have taken over the government; in Lithuania, where the Genocide Museum glosses over the Shoah and the state routinely silences Holocaust memory activists. Israel is also complicit in this. Just this week, Prime Minister Benjamin Netanyahu welcomed Jair Bolsonaro, the new president of Brazil, who has spoken highly of Adolf Hitler and threatened to ethnically cleanse the indigenous population of his country. At Yad Vashem on Tuesday, Bolsonaro attempted to rewrite the history of the Nazi Party as a “leftist” party. As the last survivors of the Shoah pass on from this life, we must address the chilling reality that Holocaust revisionism now has both a powerful elite base and a popular mass base. Yet the activities of the far right continue to receive relatively sparse attention from the organizations that claim to represent American Jews—for example, the Anti-Defamation League and the American Jewish Congress—especially when compared to criticisms of Israel’s treatment of Palestinians from Muslim women of color like Rep. Ilhan Omar or Linda Sarsour. In two weeks’ time, we will gather at our seder tables to celebrate Passover with our friends, families, congregations, and comrades, and to recount the rich allegory of our people’s fight against oppression and journey to freedom. This year, the first night of Pesach will also mark the 76th anniversary of the start of the Warsaw Ghetto Uprising. Let us pause to recall our people’s histories of struggle against those who sought to exterminate us, to honor and stand in solidarity with other struggles for liberation, and to rethink what Jewish resistance means and what it demands in our own day. “For our freedom and yours! Outlive Them NYC is an all-city coalition of antifascist Jews, allies, and accomplices organizing to defend all our communities from those who would exterminate us.